A few weeks ago, a population of hirsute strangers began gradually infiltrating Bamako. Where only a few thousand of them used to live here, their ranks soon swelled to hundreds of thousands. Newcomers to the city, they could be seen moving in unruly bands down residential streets. They loitered on street corners downtown. Much to the annoyance of local drivers, they had no idea how to cross busy streets. They squatted in public spaces, making uncouth noises. I am talking about a particular type of rural-to-urban migrant, known locally as saga. I am talking about sheep. Muslims who can afford to do so are enjoined to sacrifice one of their best animals on Tabaski. Each head of household is supposed to perform this religious duty. In some parts of the world, the preferred sacrificial beast is a cow or a goat. In Mali, it is saga — sheep. And the fact that millions of Malian families need one by the same date every year has consequences. 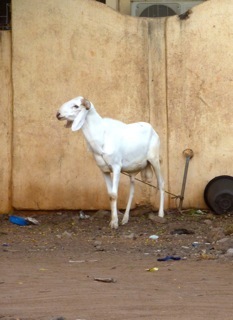 Mali is full of livestock. Despite the country’s arid climate, it is a net exporter of cattle and sheep. Malian sheep in particular are often sold in neighboring countries during the run-up to Tabaski; I’ve even heard that in years past they were exported to Libya by air. In rural Mali, Muslim families keep their own animals and usually set one aside for the annual Tabaski sacrifice. In cities like Bamako, however, few households keep sheep. 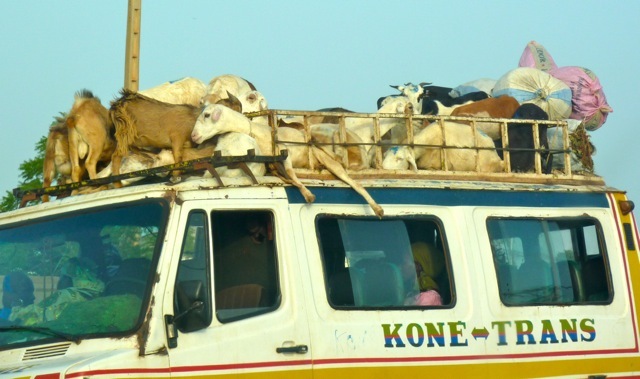 Which means that before the holiday arrives, Bamako’s need for these animals must be met by rural suppliers. With so much demand concentrated in a short period, prices inevitably go up — at least double by some accounts. Bamakois rightly complain about the rising cost of living in their city, but the cost of holiday sheep has exceeded all expectations. An animal that might have cost the equivalent of US$40 a decade ago now costs over $100; you can’t get even a small sheep before Tabaski for under $75. That’s a lot of money in a poor country like Mali. 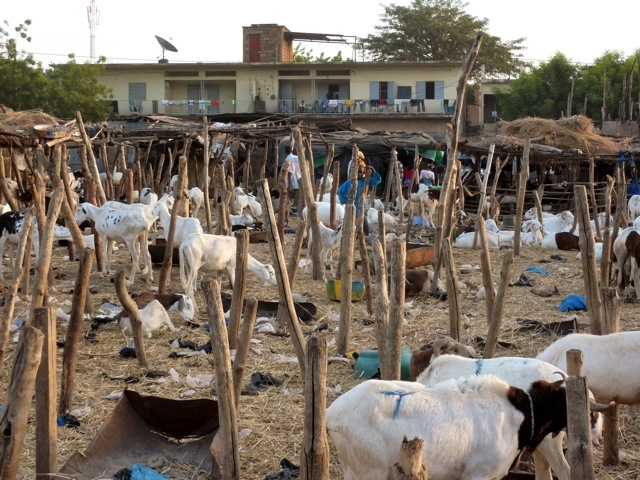 The Malian press carries consistent reports of price-gouging by livestock vendors. Many potential buyers have been simply priced out of the saga market this year. Some Bamakois wait until the eve of Tabaski, hoping to get a bargain from vendors with too many animals left unsold. Inevitably, politics comes into play, with some contending the state should do more to control prices and prevent so many sheep from being sold abroad when they are in high demand at home. Islam doesn’t force families to impoverish themselves out of respect for this holiday tradition. Only families with means are required to sacrifice a sheep or other animal. But in Bamako, the sacrifice of a saga carries considerable cultural value. It combines the tasty protein infusion of the Thanksgiving turkey with the scriptural authority of the Passover matzo. Which means that even many families that cannot afford a sheep will scrimp and beg and borrow to get one. In the last two weeks, three different men I know have approached me for financial assistance in obtaining their families’ Tabaski sheep. When I pointed out to one father in his 50s that the requirement doesn’t apply to those of limited means, he responded that his family will be shamed in the eyes of their neighbors if they can’t sacrifice a saga on Tabaski. So the ritual has also become a question of social status — keeping up with the Diallos, you might say. 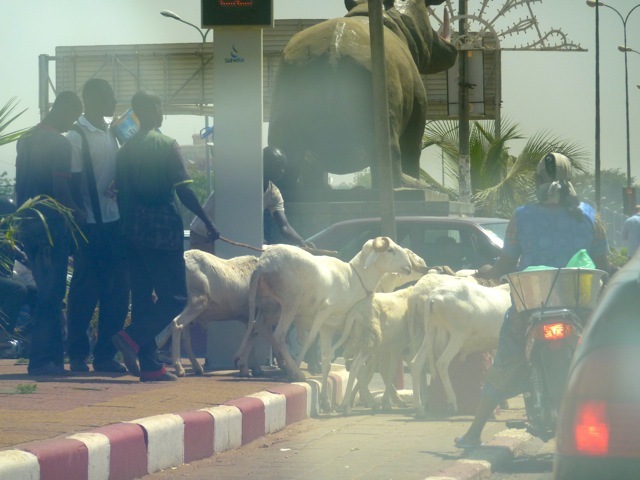 In the last few days before the holiday, roaming flocks of sheep were joined in Bamako’s streets by ambulant vendors selling knives, machetes and even hatchets for families to use in butchering their animals. As far as I could tell, the sheep were unaware of these wares’ sinister purpose. To further bring home the message of impending bloodshed, knife grinders were at work all over the city. As I write these words, the evening following the mass slaughter, the smell of roast mutton pervades the city. Families are supposed to set aside a portion of their mutton for the poor, so at least some of the benefits of the more fortunate will trickle down to Bamako’s poorer residents. 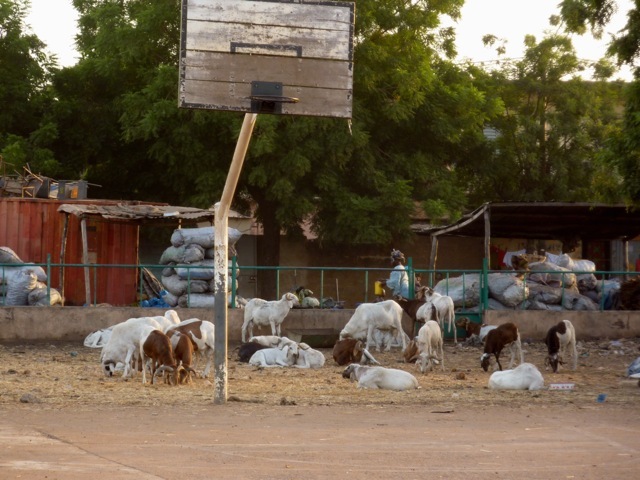 Muslims in other countries are allowed to substitute a cash donation to charity for the holiday animal sacrifice, but this option doesn’t appear to be popular in Mali. Everyone wants a saga. In view of Mali’s rapid rate of urbanization, increasing desertification and climate change, I wonder whether this holiday tradition will prove ecologically and economically sustainable in the years to come. As for my family, mindful of the effect that our slaughtering an animal would likely have on my children’s delicate First-World sensibilities, my wife and I opted to forego the sacrifice. For dinner this Tabaski, we had spaghetti and meatballs instead. And it was most excellent. Thanks Heather. I really think I deserve to be congratulated for not giving in to the temptation to title this post “Putting the Baa in Baa-mako,” or something along those lines. It took considerable self-control, I can tell you!